The United Nations General Assembly will consider today, for the twenty third time, this issue which is so important for the international community, because it has to do with International Law, which protects all States, whether big or small, rich or poor, and is what guarantees their independence and exercise of their national sovereignty, which is the basis of sovereign equality. It is also directly linked to the enjoyment of human rights by all persons and by all peoples. This matter concerns freedom of trade and navigation, which protects the interests of States, companies and individuals. However, we are gathered here at a very peculiar international juncture, characterized by serious threats to international peace and security; atrocious wars and terrorist actions of extreme cruelty; the risk posed by the existence of huge nuclear arsenals; the unusual military expenditures, which are of no use to solve any of the serious problems facing the world’s population, which is quickly approaching the figure of eight billion. This is a crucial moment in the impact of climate change which, among other catastrophic consequences, can provoke unprecedented famine, generalized extreme poverty in entire regions and massive migration waves. We are living in an age characterized by a systemic global crisis and the superimposition of its economic, food, energy and water resources components. Together with poverty, which takes a higher toll on human lives than wars, there is an increased risk posed by serious diseases like the Ebola virus disease, an epidemic that could become one of the worst pandemics in history if it is not stopped and resolved in the affected sister nations of Western Africa through the urgent and effective cooperation of all. All these make up an unprecedented combination of problems, old and new, that tend to make human life unsustainable. None of them can be resolved if we do not change our attitude and our way to confront and attempt to transform reality to establish a genuine cooperation in the interest of the survival of humanity. As was recently written by Comrade Fidel Castro “any sensible person would know that the political decisions that entail some risk for the highly qualified staff involve a high level of responsibility from those who call on them to fulfill a risky task. This is something far more difficult than sending soldiers to fight and even die for a just political cause; and they also did so because they always thought it was their duty. It is a fact that, in recent times, the economic, commercial and financial blockade imposed by the United States against Cuba has been tightened and that its extraterritorial implementation in all regions of the world have also been strengthened, in particular through the application of huge and unprecedented fines amounting to 11 billion dollars against 38 banks, among them the French bank BNP Paribas, for doing transactions with Cuba and other countries. The accumulated economic damages, which are huge for a small economy like ours, amount to 1 trillion 112 534 billion dollars, estimated on the basis of the price of gold, which is being manipulated by those who created the nefarious monetary system currently in force, which is already being harmed by the impact of an insurmountable crisis which affects the poorest countries. The human damages caused by the blockade are on the rise. The number of Cubans who have been born under these circumstances already account for 77 per cent. The hardships of our families can not be accounted for. There are many international conventions that proscribe the blockade, including the Geneva Convention of 1948 against genocide. The exercise of human rights by an entire people is being impaired. The economic development of the country is seriously hampered. Although our health and social care systems manage to prevent the loss of human rights, no honest person, whether in the United States or the world, could agree with the devastating consequences caused by the blockade. Despite everything, our national culture, education and guarantee of equal rights and opportunities make it possible for us to be a cultured and fraternal nation. On both sides of the Florida Straits, the peoples of the United States and Cuba have always had close links. Despite the systematic slanderous campaigns launched against our country during half a century, the US people supported the return of the Cuban child kidnapped in 1999 to his family. 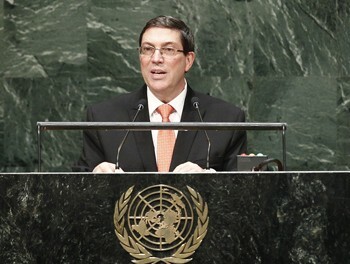 Cuba offered every possible assistance in the immediate aftermath of the terrible terrorist actions occurred on September 11, 2001, when thousands of flying planes were left without a place to land and, later on, to palliate the deficit of antibiotics, at the time of the anthrax attacks in the United States. In 2005, truly concerned about the damages that were being caused by hurricane Katrina, we offered medical cooperation to the people of New Orleans, a moment that marked the creation of the medical contingent specialized in the management of disaster situations and epidemics named after Henry Reeve, a heroic young American who fought for the independence of Cuba back in the 19th century; which is now being deployed in Sierra Leone, Liberia and Guinea. Its prestigious name identified the brigade that in 2005 assisted Pakistan in the aftermath of the earthquake, and continued to engage in a fruitful cooperation with the US military medical personnel, which had already started in El Salvador, after the earthquake of 2001, and later on in Guatemala in the years 2002 and 2003 during the treatment of onchocerciasis. In 2010, after the earthquake in Haiti, the United States and Cuba also cooperated to assist that long-suffering nation. The Cuban Government invariably shared with the US government the reports about plans of terrorist actions or attacks being perpetrated against the United States. Despite the old tensions and the attempts by violent extremists and terrorist groups of encouraging them, there has not been any war nor has any young American died in Cuba. Cuba, despite being slandered, has never been a threat to the national security of the United States. There isn’t any hostility between our peoples. Cuba hospitably welcomes the few Americans who are allowed by their government to visit our country or who face the legal risks that might result from doing it, as well as those who come to offer humanitarian assistance, such as the members of “Pastors for Peace”, or to study Medicine. There are well known opinion polls showing the increasing and majority support from absolutely all sectors of the US society that favor the lifting of the blockade and the normalization of bilateral relations. Particularly noteworthy is the fact that this becomes all the more remarkable in Florida, something that is also confirmed by the electoral vote trends shown during the most recent presidential elections. Political personalities of the most diverse trends as well as outstanding scholars have recognized that this policy has failed to meet its purpose and has not served the national interests of that power. Suffice it to read the editorials published by The New York Times in recent weeks. Religious leaders have cited legitimate and indisputable ethical and humanitarian reasons to ask for a change. American citizens are claiming for the freedom of traveling to the only place in the planet where they are prevented from doing so, as well as for the right to receive direct and personal information about the Cuban reality. Entrepreneurial organizations and business people believe that the blockade harms their economic interests. The majority public opinion is opposed to maintaining the current state of affairs and is expressing so in an ever more critical way. Cuban émigrés have been affected by discriminatory measures and have had to cope with numerous obstacles hindering family reunification, traveling in both directions, the excessive costs imposed on them, political manipulation and even terrorist violence. But the majority wishes peace and wellbeing for their relatives and their people and having a normal relation with their home nation. What’s the use of encouraging the illegal use of information technologies instead of authorizing mutually beneficial businesses in the area of telecommunications? What’s the use of preventing Cuba’s connection to nearby submarine cables, thus limiting and hindering our connectivity? The blockade is harmful to Cuba but it is also harmful to the United States. The absurd and ridiculous inclusion of Cuba in the list of States that sponsor international terrorism, which has been used to justify the imposition of additional financial sanctions, redounds to the discredit of the United States. The sixteen years of unjust imprisonment imposed by fraudulent means on the three Cuban anti-terrorist fighters have not weakened them. Quite on the contrary, it has turned them into heroes and an example for the future generations of Cubans as well as a source of pride for those whose sacrifice contributed to pave the way towards a new Cuba. The decision of lifting the blockade will be welcomed at the global level and will become a unitary influence in the interest of peace and the peaceful settlement of conflicts and differences. After the limited but positive measures of 2009 and 2011 regarding family visits, remittances of Cubans who settled in the US territory and the travel licenses for certain categories of US citizens to engage in exchanges of various sorts, the technical dialogue has been expanded to include other aspects and cooperation has increased in areas such as the confrontation of drug trafficking, transnational crime, trafficking in persons, oil spills prevention, search and rescue operations, air and aviation safety or in the event of any other specific occurrence. The reaction on the part of the US society and the international community to these modest advances has been that of support and encouragement. President Barack Obama has been entrusted with all the constitutional prerogatives, without requiring the support of the Congress, to modify some crucial aspects of the blockade and introduce a new and decisive dynamic in bilateral relations. We invite the government of the United States to establish a mutually respectful relation, based on reciprocity, sovereign equality, the principles of International Law and the UN Charter. We can try to find a solution to our differences through a respectful dialogue and cooperation in areas of common interest. We can live and deal with each other in a civilized way, despite our differences. At this difficult and special juncture, I should ask you to vote in favor of draft Resolution A/69/L.4 entitled “Necessity of ending the economic, commercial and financial embargo imposed by the United States of America against Cuba”, to support the idea that the current serious problems facing humanity make it an imperative to change our way to deal with each other to be able to solve those problems, preserve peace and human life. Vancouver Protest Calls for an End to the U.S. Blockade on Cuba!